The ACLU has sued South Dakota on behalf of indigenous and environmental activists, saying state laws violates the First Amendment right to protest. Nick Tilsen, a citizen of the Oglala Lakota Nation, attended his first protest before he was even 5 years old. Since then, he hasn't stopped — and that includes joining protests at Standing Rock in 2016 in an ultimately failed effort to stop the construction of the Dakota Access Pipeline. So when South Dakota lawmakers introduced the “Pipeline Package” in early March, Tilsen quickly took notice. He worried it would affect his constitutional right to freedom of assembly. Tilsen finds the new law troubling. “They’re basically criminalizing anybody who is standing up for their rights and putting their voice out there — and those who support us,” he said. After learning about the bill, Tilsen, who lives on the Pine Ridge Reservation, reached out to a local lawyer, who put him in touch with the American Civil Liberties Union (ACLU) of South Dakota. Along with a group of plaintiffs, including the Sierra Club, the ACLU filed a suit Thursday challenging SB 189 and two mirroring criminal statutes, saying the laws violate the First and Fourteenth Amendment rights of free speech and due process under the law. Is the 'Pipeline Package' legal? “I fully support the freedoms of speech and assembly, but we must also have clear expectations and the rule of law,” Noem said in a statement after the package of laws passed. The ACLU think the SB 189 goes too far. “Our concern and the reason we are filing this case is that it will silence dissent and chill people from speaking out,” Vera Eidelman, one of ACLU’s attorneys on the case, said. The ACLU believes under the law, people who want to protest pipelines or encourage others to protest would now risk civil liabilities and prosecution if a “riot” — under the state’s definition — were to occur. Eidelman thinks this would lead to self-censorship and therefore a loss of First Amendment rights. “The response of the government to protest ought to be engaging on the issue, listening to the concerns of the people that are speaking out, and trying to respect and work with them — not stifle First Amendment rights,” Eidelman said. Under the law, if an organization were to encourage people to attend a protest via social media and a fight then broke out there, that organization could now be held civilly liable, Eidelman explained. Elly Page, a lawyer and legal adviser specializing in freedom of assembly for the International Center for Not-for-Profit Law said South Dakota’s “Pipeline Package” is one in a growing trend. “We’ve seen more than 20 bills in the past two years that targeted pipeline protests implicitly or explicitly,” Page said. Three states, including South Dakota, have passed such laws, and laws are pending in 10 others. Under SB 189, TransCanada, the maker and operator of the Keystone Pipeline, could take money from organizations or individuals who "riot boosted.” This worries Page. “That uncertainty, especially in combination with the law of civil liability, is more likely than not to discourage people from organizing and protesting in the first place,” she said. TransCanada did not respond to NBC News’ request for comment. Dallas Goldtooth, who is Dakota and Diné, is one of the plaintiffs in the suit. An organizer for the Indigenous Environmental Network, he thinks the pipeline bills directly targets Native people. “The most active and present opponents of this project have been Native people,” Goldtooth, 35, told NBC News. 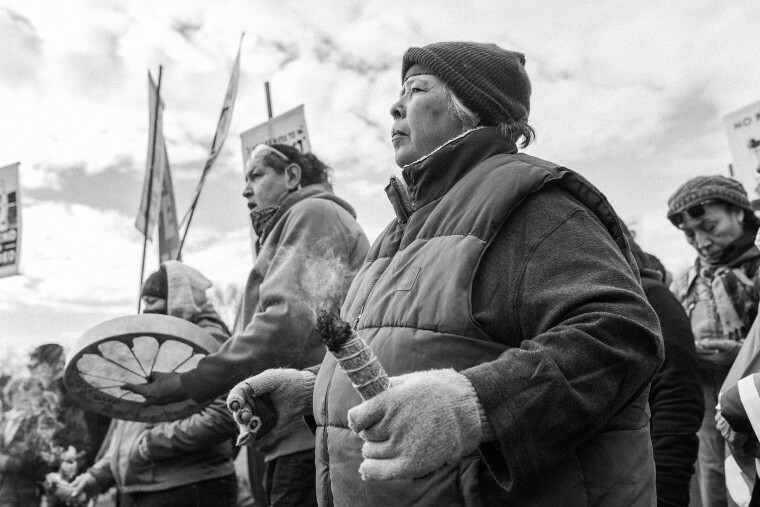 “When Keystone XL was proposed, it was tribes and grassroots organizers who stepped in and delayed it." Tilsen agrees. “Pipelines come through indigenous territories” and “have no respect for our sovereignty,” he said, adding that commonplace pipeline leaks pose a risk to his community's water. In 2017, at least 200,000 gallons of oil leaked from the Keystone Pipeline in South Dakota. While justifying the “Pipeline Package” to the legislature, South Dakota referenced “661 professional protesters” in North Dakota who were arrested at Standing Rock. But South Dakota legislators don’t believe that citing Standing Rock means they are targeting Native communities. That’s an argument Goldtooth doesn’t buy. “It’s obvious as ever," he said, "that they are targeting us."